This app no longer works. I called the Anchorage Daily News weeks ago, and they said yes, there are problems with the app, but it still hasn’t been fixed. They gave me a work around that involves opening the e-edition (digital) in Safari, and bookmarking it, but you have to be a paid subscriber with an account number to do that. This app used to work great but now it doesn’t. I have it installed on 3devices as a paid subscriber for the digital newspaper. It works one day then has to be reinstalled. Please fix it. The work around is to use the ADN website which is not the newspaper. Please fix this app!!!! Every time I’ve tried to use this app I get a ‘loading’ message. It never actually opens. I’ve tried deleting and re-downloading the app several times with the same result. DO NOT BUY THIS APP! Lost my fee because ADN wouldn't help with subscription. They said I was an app subscriber...not their problem. No one at app to refund money. I was hoping that the app would be cleaner and better designed than ADN's web site, but it is just as cluttered and messy. As a subscriber to the print edition, I would also expect to have free access to the app content, but such is not the case. ADN is a good newspaper in my opinion, but they are not yet ready for the digital age, and will probably succumb to competition from those who are. Too bad, but as much as I love print, I'm not going to give away my money to support a lost cause. ADN needs to get its app together. The app worked fine during its trail period, but once I subscribed it will not allow me to access the electronic issue of the newpaper. It keeps telling me that I need to subscribe, when I already have. The time is clicking on my subscription, and this app need an upgrade. The app support link in Itunes takes you to the Alaska Daily News circulation department, which unfortunately has nothing to do with the iPad version. They need to do an upgrade, and soon. Thought about how the app may be failing, so I deleted the app from my iPad, and then reinstalled it. Now it appears to work, but will have to test it to see that the same error does not occur. This fix seems to work. If you are having troubles with the subscription not being recognized, try deleting the app and reinstalling it, and then restore your subscription. It worked for me. The app randomly locks me out of the paper. It directs me to the ADN circulation desk for support, but they tell me they cannot do anything and they direct me back to the Apple App Store who directs me back to the ADN circulation desk in an endless frustrating loop. I haven't been able to get on all week this time. Very annoying. The app is great when it works. But often it won't load or like now it loads but the each page goes blank with some electronic colors -- like when a computer dies. We travel a lot. Rather than have someone keep all our 'old newspapers', we download the daily newspaper while in the L48 or overseas. It is always great to keep up with the local news even when out of Alaska. 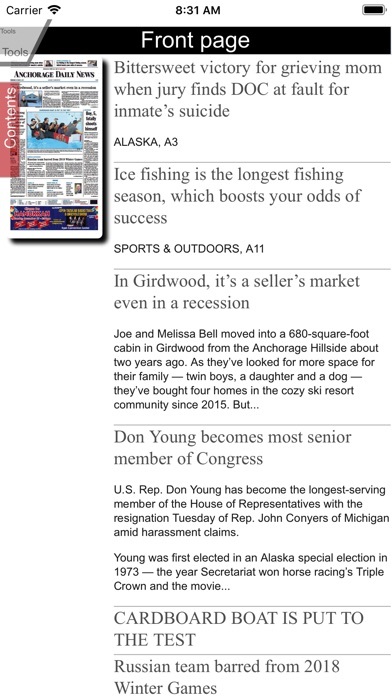 After downloading a day's newspaper, you can click on an article and it zooms in for easy reading or you can use your fingers to expand an article to full screen. I'm just a paying subscriber like everyone else, but I have been working with the ADN Circulation Director via email over the auto-renewal lock-out issues. At this point in time it seems to be working as it should. If you have been locked out of your paid subscription then this is the current instructions from ADN to get it unlocked and refreshed- "The iPad app developers think they have resolved our problem with the app and they turned on the authentication again. When you open the app you should be asked to log in. If you get the choice of "other issues" or "subscribe", choose subscribe. On the next page press the restore button in the upper right corner. They tell me it should be working correctly now. It seems to be working on my iPad. Please let me know if yours is working correctly." Once you hit the "restore" button you will have to put in your iTunes ID. The way a digital newspaper should be! This is by far the best newspaper presentation I have seen. The paper is displayed as the print version, with zoom capability. You can also open articles exclusively. Very nicely done. Absolutely no performance issues on my iPad Air. Hopefully some other newspapers will take note. Nicely done ADN! I've been reading this paper online for a couple years. This new app has apparently been reconfigured and does not allow for the two finger zoom. Bluntly stated the lack of this feature makes moving around the page difficult and cumbersome. Fix it or I'm gone. I love the e-edition of ADN. 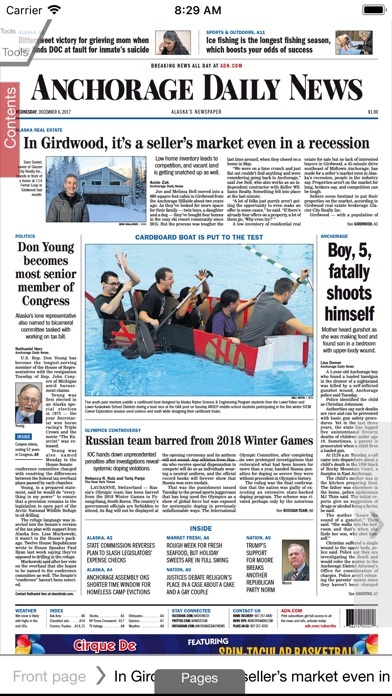 I live in Alaska and rely on it for local and regional news. It is nice to have on my ipad to read during my daily commute into Anchorage via the Share-A-Van. But one thing is lacking. The ability to print. I would love to be able to print coupons, etc. I hope the developers of this great edition of ADN will provide a clip and print option in the next update. Hello? Is anyone at ADN there? Now it wont even open. Have you all left the building for greener pastures? I really appreciate this app. And I LOVE not having mounds of papers to get rid of! Works for me! 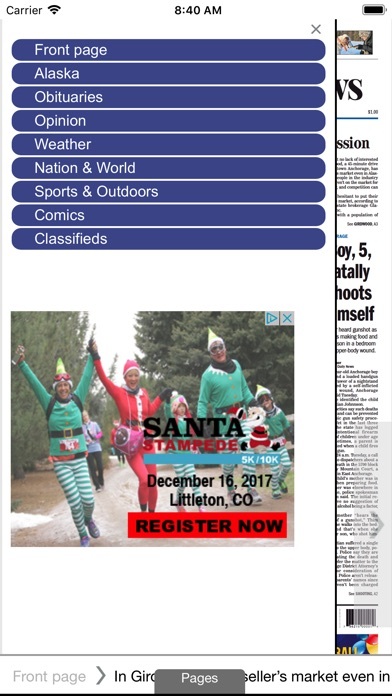 There is in way to "sign in" to read the digital version of the paper to avoid Cal Worthington's HUGE banner ad (that only makes me never want to buy a car from him). The Help section doesn't tell you how to sign in. I sign in thru the app store, takes the lock banner only then to tell me I'm unauthorized and need to subscribe. So I try to subscribe and it tells me my subscription runs thru Jan 1, 2013. I GIVE UP. Like the others, this app quits working after auto-renewal. Support directs you to ADN circulation, who can't do anything about the app. For Alaska news, get the KTUU or Fairbanks Daily News-Miner apps. Far more functional. The biggest problem I am experiencing is that the current issue isn't uploading to my iPad. It's an intermittent problem, but has happened often enough in the 3 weeks I've had the app to have an issue with it. I've emailed questions to customer service and have not gotten any response. 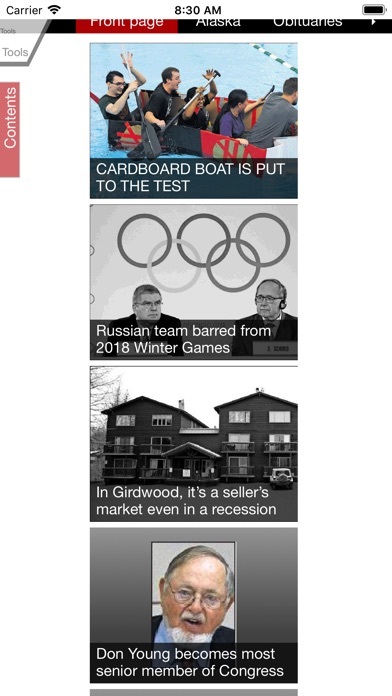 In addition, the app brings static news; the website gets updated regularly but the app edition is only once a day? This is not what I expected it to be at all. I'd like to believe it will be upgraded to a model comparable to the NYT. mcClatchy has the money to do this. This app opens for a few days then goes to “loading “ and never opens. Must be deleted and reloaded with password. Please fix the app! Will soon cancel subscription if not fixed. App not working for us on January 1. This would be great, but it needs newsstand support. The previous version of this app allowed users to see the entire paper, this version doesn't work that way. You see a panel of a story, that maybe today's or yesterday's, even last weeks. No advertising, comics, extras that have been in previous versions of the app. Not worth the expense. Terrible change to what was a great app. Not sure what happened with this most recent update but I can't scroll to the bottom of any page now! It worked fine before and now... It won't go past what fits on the screen. Please fix this so I can actually read the news. Subscribed for a year. Got locked out after a month and got pestered to subscribe again. When I called the paper for support, got a run around complete with, " I don't handle that, call the main number. This is why I gave up the print edition. This paper cannot go under soon enough. Save your money. Don't subscribe. 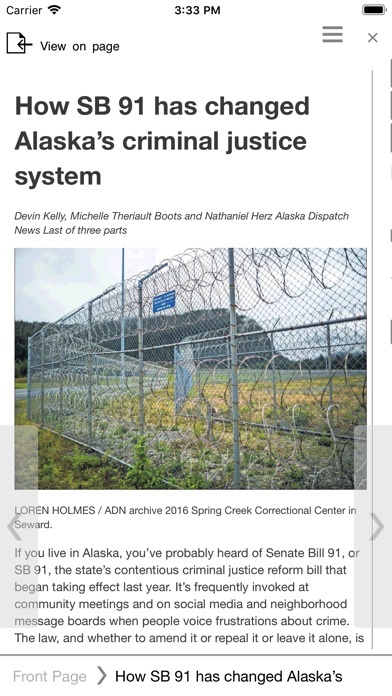 Since the upgrade, to open the app and see the whole page I have to go to the adn web site, click on e-edition and put in phone number without hyphen ( example shows using hyphen), click enter, and I get the whole page in type too small to read. Unable to enlarge type. Useless. I'm calling for the third time to get help and will probably cancel. This App is not ready for general use. It does not remember your user ID or Password. If you double click on a story, then return to the original page, it logs you out…then you must re-enter user ID and Password. This gets old when it happens multiple times trying to read the same issue of the paper. Also, the download paper to read off line does not work. ADN does not offer any support to try to correct these problems. ADN, please resolve these problems. The ADN app WAS outstanding, until my auto-renewal kicked in after one month. Now it tells me to sign in, but offers no place to accomplish this simple task. I even tried to re-subscribe, but to no avail. This app was working well, but doesn't now. DO NOT BUY THIS APP if you also like read the electronic paper on your desk top! This APP ONLY buys you acsess to the iPad edition it DOES NOT BUY you a subscription to the Alaska Dispatch electronic edition for all your devises. So even though I paid $69.99 to renew my subscription. I can only acsess the electronic paper on my iPad. The Alaska Dispatch does not consider me a subscriber to the newspaper and will not allow me to log in. But if you pay Alaska Dispatch directly SUPPOSEDLY you can download the same app and have acsess to the whole kitten-caboodle, go figure. DO NOT BELIEVE THAT YOU CAN RENEW YOUR SUBSCRIPTION AT ADN NEWS THRU THE RENEWAL PROCESS OF THIS APP. Any questions call (866) 528-0236 and ask for the supervisor EVA for her explanation. love the full newspaper subscription--but the monthly renewal process is not seamless. we have to wait a day or two for the site to remember we are on automatic renewal. ADN should look into using a more prompt system or carrier or service. This is a painfully bad app. Just go to the website - the app just takes up room and is frustrating. Sunday morning 9am and still no paper. This is not the first time. There is no contact info to notify someone that the app isn't working. Every time it try to put a review up it says nickname taken and erases the entire message. You just went from 2 stars to 1. The app works well enough, but the fonts are blurry and unreadable on my iPad 3 without zooming in on an article. Please fix for hi-res displays?